CDs and DVDs — all flavors — play from the inside out, the opposite of a vinyl LP. Instead of the record staying a steady speed—and the distortion and noise increasing as you go, like an LP—the CD/DVD actually plays the DATA at a constant speed by slowly increasing the speed of the disk's rotation as it plays. Fifty years ago this was impossible, but today we have tiny, inexpensive computer-controlled motors to spin the disks. These little motors have their own computer chip built in so the CD or DVD player's computer can talk to the motor and tell it how fast it needs to go from time to time as it is playing the disk. CDs USED TO BE almost indestructible! They were too good in fact for greedy record companies who were not selling as many replacement CDs as they had sold replacement LPs, and so the record companies beat up the CD equipment makers to make CD players less fault-tolerant and more prone to errors! It's true! When I got my first CD player in early 1984, I called the late Bart Locanthi, a former Caltech physicist who had participated in the development of the CD player and disk system. He told me to take any CD and randomly drill half a dozen quarter-inch holes in it, and it would still play just fine. Nowadays, one greasy fingerprint will stop a CD from playing. What? You thought only politicians screw the public? Q: How is a CD different from a CD-R? A 1: CDs (Compact Discs) are made of injection-molded plastic formed under very high pressure inside the molding machine. 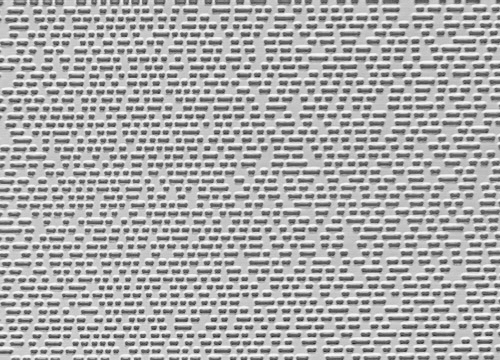 The top and bottom surfaces of the mold are one polished, flat blank and a "stamper" or "father" reverse of the data surface. After cooling the plastic, the disk is lifted by a robot arm and suction cup, and positioned in a vacuum chamber where metal vapor is deposited onto the data surface using up to 20,000 watts, making it a "reflective" surface." The reflective surface has actual physical pits in the flat surface that reflect the laser inside a CD or DVD player and as those reflections hit and miss the laser's companion photo diode, the hits and misses are sensed as 1's and 0's. The ones and zeros are the digital data that streams out and gets converted into a stream of audio information by a circuit called a D-to-A (digital-to-analog) converter, that we can listen to. By the way, the reflective layer is aluminum and would rot from exposure to air, so it is coated with a thin layer of lacquer. It's the lacquer layer that gets printed on, and it's only about 70 nm or 3 millionths of an inch thick (1/1000 the width of a human hair), which is why CDs are so easy to mess up by leaving them out of their cases. The spiral track is magnified so much it looks like parallel lines. 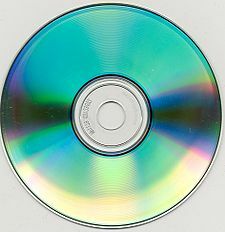 A 2: CD-Rs (Compact Disc Recordables) are made somewhat the same way as CDs except that on the CD-R a light-sensitive layer of dye is applied under that layer of lacquer. When the relatively weak laser beam in a computer's CD or DVD burner hits the dye layer, the light strikes change the color of the dye. By turning the laser on and off very fast while the disk rotates, tiny dots and dashes ranging in size from 500 nm to 3500 nm are drawn on the dye layer for the CD player's laser to read later. Since these "painted on pits" are not like a real CD pit, it can be a problem to read CD-Rs in some players. Further, the dye layer, being light-sensitive, can be erased altogether if a CD-R should be accidentally left on a car's rear seat deck or dashboard or anywhere in direct sunlight even for fairly short amounts of time. IF YOU WANT TO KNOW MORE THAN YOU'D EVER WANT TO KNOW ABOUT CD MANUFACTURING, VISIT WIKIPEDIA AND READ WHAT I DID. GETS INTENSE, BUT IT'S STILL INTERESTING. Q: WHAT IS CD DUPLICATION? A: Duplication refers to CD-Rs burned by computers with multiple CD burners attached. These days machines usually consist of desktop-style computer towers stuffed with a number of CD/DVD burners that will burn pretty much any flavor of CD, + or - and DVD + or - and others. The towers are loaded up with blank CD-Rs and the master CD-R is placed in the top, read-only drive, and the "go" button is pushed. A special dedicated pre-programmed simple computer inside the tower reads the master and copies the data bits identically to the other burner drives. Labels for CD-Rs range from hand-applied paper labels to cosmetically indistinguishable professional printed labeling applied by a separate printer. Small quantities of CD copies are more attractive to competing copy suppliers because unskilled labor can be hired at car wash pay to make copies and feed them through printers and a shrink-wrap machine. Traditionally, under 300 copies were too uneconomical to run in replication plants because the glass disk master, father and mother plating and stamper making part of the process costs the same for 10 or 10,000 disks and the plants could not offer attractive prices on very short runs, whereas CD-R duplication is very profitable because there is essentially no machinery cost involved, and not much labor cost. Typical duplicated CD-Rs in a nice package will still cost about $2 — $3 apiece because the cost of the CD-R is fixed. When replication gets cranked up, however, replicated CDs can cost as little as a few cents apiece. On orders of 10,000 or more, it's not unusual to find plants that will include a DVD with your CD, for about $0.80 more. If you want the disks to last, they MUST be replicated. If you make records rarely, play jazz or classical music and take it fairly seriously, replication is for you. If you're selling CDs out of your guitar case at gigs and plan to make a new CD from each show you do, you'd probably make money by purchasing your own CD-R duplicating setup from a company like Discmakers, with a nice disk duplication package with burners and printer for a few thousand dollars, and get some other artists you know to let you help them with their disks for the same type of sales strategy. CDs hold up to 74 minutes (1 hour and 14 minutes) of music. If you want to cram more on a CD, be prepared to fight for it and sign off that it might not play in a car or a cheap player. Read up on CD packaging and printing, artwork and typesetting. It's a lot like practicing; the more prepared you are, the easier the process you'll find yourself facing when you go to make CDs. Get good help where you need it. False economy is the most expensive kind. A watercolor artist friend might make just the right painting for your CD cover, but you still need to digitize it at 300 dots per inch, color correct it, lay it out in a Photoshop template from the CD manufacturer or print shop, provide bleed at the edges (that means the picture needs to be slightly bigger at the edges than what you actually see on the product), and ask for a check proof print before they crank up the printing press.